DuPontª Tyvek¨ overboot, model POBA. Knee-length overboot available in white and in one size. Elasticated top and fixation ties. Stitched internal seams. Slip-retardant sole. 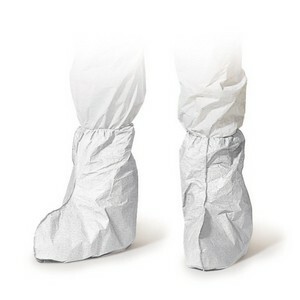 Specially designed for use with Tyvek¨ apparel, Tyvek¨ accessories can help offer enhanced protection for body parts that are more exposed to hazardous substances. Tyvek¨ garments and accessories are composed of flash spun high density polyethylene, providing an ideal balance of protection, durability and comfort. Tyvek¨ is permeable to both air and water vapour, yet repels water-based liquids and aerosols. It offers an excellent barrier against fine particles and fibres (down to 1 micron in size), is ultra-low-linting and antistatically treated. Silicon non-added. Applications include: pharmaceutical handling, chemical protection, lead and asbestos abatement/remediation, general maintenance/operations, spray painting and general clean-up, amongst many others. This accessory is not CE certified as chemical protective clothing. Antistatic treatment (EN1149-5) on both sides, excludes slip-retardant sole.